Welcome to the gateway to the weekend! We hope you've had an amazing week, and now it's time for some fun. Ready to get inspired? Let's do it! I think it goes without saying that we are inspired by others in this fun paper crafting hobby. We visit blogs, pin cards on Pinterest, peruse Instagram, and ooh and aah over the things we see our friends making. It's always fun to take inspiration from all of the creative people out there in the great big world. On February 23rd there was a card by Svetlana Pavlova posted in our You've Been Spotted series. You can see the original post HERE, and you can see her card below. Svetlana and I live approximately 5500 miles away from each other, but through the power of social media, I'm so glad that I got to know her through this very fun design. Ever since I saw Svetlana's card, I've been dying to use her basic concept as the jumping off point for a card of my own. I love how the card base is completely blank except for the super fun circle she created for her focal point. It's simple and perfect for showcasing some cute stamps like the ones we have at My Favorite Things. 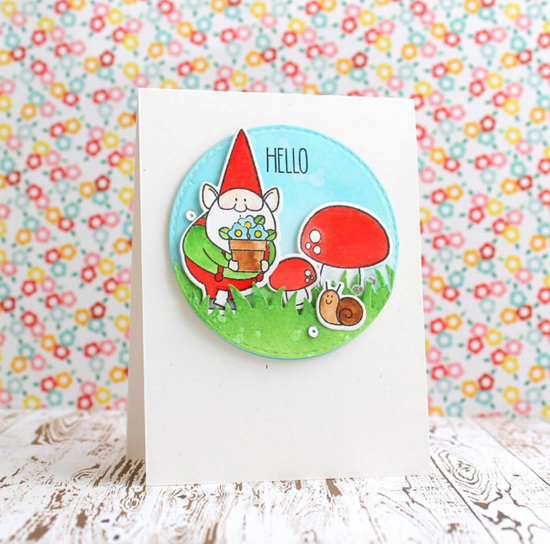 While Svetlana showcased the You Gnome Me stamp set and Die-namics on her card, I went a slightly different direction. 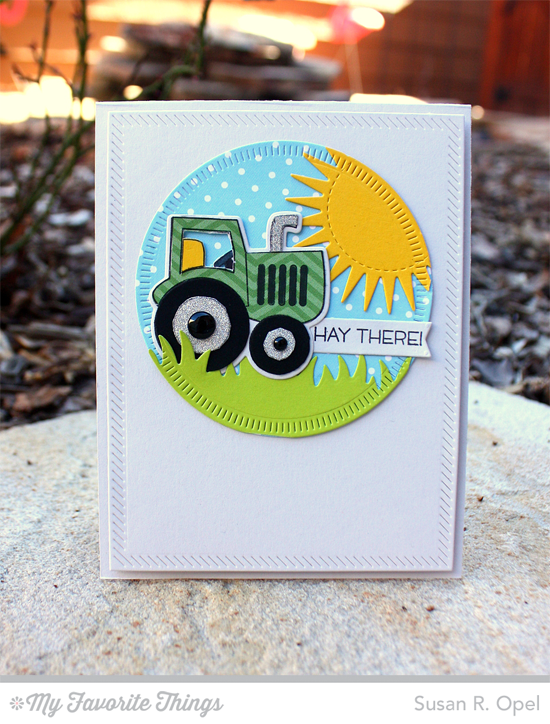 I grew up in the country, so I've been excited to use the tractor from the Farm-tastic stamp set and Die-namics. I added grass and bright sunshine, and my blue sky was created with patterned paper from the Lucky Prints Paper Pack. Such a fun card to create! Thank you so much for the inspiration, Svetlana! How about that idea to spur your next creation? Take the basic gist of a card you love and morph it into your very own design. It's fun to do! You nailed it!! I'm inspired by social media every single day! So cute. Love them both.